High commodity prices of corn, soybeans, wheat and other commodities have helped push farmland prices across the United States. The U.S. mid-west had seen an acre of farmland prices rose by more than 200% from an average price of $2,275 to $8,700 with the availability of cash and credit. The state Iowa, where favourable weather and fertile soil could be found, a record sale of $21,900 per acre had been made, according to Iowa State University economist Mr. Mike Duffy, who had been monitoring land prices. "Ethanol and livestock production help foster demand for limited growing space, farmland values have soared 90 percent since 2009," Mr. Duffy tells the USAToday.com. Liberty Trust and Savings Bank vice president Michael Hein in the southeast Iowa town of Durant explains that if profits begin to fluctuate, land prices may also soon decline. Mr. Hein tells USAToday.com that in 2013, prices may moderately post increases for land values. This assessment coincides with the forecast of the USDA for commodities harvests in 2013. 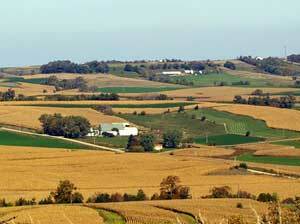 Higher commodities harvest and good weather will likely push land prices up.